Guillermo Del Toro’s movie Pacific Rim has nothing to fear from Gareth Edwards’ Godzilla film. Likewise, JJ Abrams’ movie Cloverfield is far from perfect, but it is more interesting and entertaining than Gareth Edwards’ Godzilla. Unfortunately, American/British filmmakers have demonstrated once again that the intangibles of “Gojira” remain outside of their grasp. The new Godzilla movie is a marginal improvement over Roland Emmerich’s horrible film of the same name. This is no great complement. Godzilla 1998 was cinematic refuse. Godzilla 2014 is tedious and uninteresting: it is boring. The new Godzilla is more like the friendly pet monster of the late 1970's children's cartoon than a force of nature, a legend, and the almighty King of the Monsters. The new Godzilla is apparently prone to exhaustion, like a man once he expends his manly seed, after using his atomic breath. Gareth Edwards’ Godzilla is also very obliging to the human beings in the film and seems to go out of his way to avoid causing undo harm to their cities, personhood, or other property. Who knows? Maybe Godzilla is part of a long line of insurance adjusters or actuaries? The citizens of San Francisco are thankful for Godzilla’s courtesy and kindness as they give him a standing ovation—and maybe even the keys to the city—at the end of the movie. Gareth Edwards showed great heart and creativity in his 2010 independent film “Monsters”. To the (then) delight of Godzilla fans, the skill on display there made him the natural choice for the 2014 reboot of the Godzilla franchise. The 15,000 dollars spent on Monsters is infinitesimal compared to the new Godzilla movie’s 160 million dollar budget. Unfortunately, those great resources were not able to improve a film that fails to provide either the social commentary of the 1954 classic or the fun “men in suits guilty pleasure” of the Japanese Toho sequels. For Gareth Edwards, less may indeed be more. The new Godzilla begins with intrigue and a compelling hook: unfortunately, the redacted opening credits and historic montage are the most interesting part of the two hour film that follows. Gareth Edwards and his writers reimagine the Godzilla mythology by suggesting that the titular character is an ancient creature that the American and Japanese governments have been aware of for decades. Consequently, the Cold War nuclear weapons tests during the 1950s in the Pacific were in fact a concerted effort to destroy Godzilla. Godzilla has not been seen since the bombing of the Bikini atoll and a secret international program has been put in place to monitor the Earth for his return—or that of other monsters. Here, Gareth Edwards missed a great opportunity to craft an entertaining and compelling Godzilla movie. He could have followed the logic of some of the original Japanese films and presented a world that is aware that giant monsters such as Godzilla exist, and thus has been preparing for their return. Or Gareth Edwards could have more fully developed the conspiracy theory hinted at by the movie’s allusion to the recent Fukushima disaster to its natural conclusion (what if the meltdown was caused by a giant monster and not by an earthquake?) and had the truth revealed to a now frightened public by an activist, investigative journalist, or conscientious citizen. In this scenario, Godzilla is the punishment for man’s sins against nature. He is coming for vengeance whether humankind is prepared or not. As shown in the trailers for the new Godzilla movie, other creatures appear (called “MUTOs”) and havoc ensues. The film opts for a slow burn while the audience waits for the inevitable clash between Godzilla and the two other creatures while the American military hatches a desperate scheme to stop them. Gareth Edwards’ pacing and narrative are the central problems in Godzilla. The most interesting action scenes are shown on TV screens in the background of the frame. The fights between the monsters, with the exception of the climax, are either prematurely cut away from, or the audience is only shown the aftermath of the battle. Part of the charm of the original Toho Godzilla films is how the military is unable to stop Godzilla (or any of the other monsters that routinely appear to terrorize Japan). Perhaps because of the Pentagon’s consulting on the film (with few exceptions), the audience is denied seeing the United States military torn to pieces, and its soldiers obliterated, by the monsters. To point. The film shows a 60 ton Abrams tank thrown about like a toy—but the audience never has the pleasure of seeing the actual MUTO on military violence in graphic detail on more than one occasion. In the face of an attack by Godzilla or similar creatures, one would also expect a certain amount of hubris and over-confidence from the United States military. They are the dominant military force on the planet. How could they not defeat a few ancient creatures? Moreover, the tactical and strategic decisions by the United States military in Godzilla are barely disguised and lazy conceits to cinematic necessity. For example, United States Navy ships face down Godzilla from a hundred yards (if not mere feet) away. In fact, Godzilla is so close to the ships that their missiles are unable to hit him. The massive firepower that would have been deployed from beyond the horizon against 300 foot tall creatures is almost impossible to comprehend. Of course, this could have potentially made for a boring movie in the hands of a less skilled director. But, part of the fun of Godzilla and the kaiju film genre is seeing the military throw its best punch and the monsters still survive. Gareth Edwards had all of the toys; however, Gareth Edwards did not use them wisely. Instead, the military’s leadership is calm, soldiers do not panic as they are routed, there is no mass mayhem among the public, the President is not given an obligatory cameo or speech to the nation and the world goes on while two major American cities are all but destroyed by Godzilla and the MUTOs. Consequently, Godzilla lacks tension or suspense. The acting in Godzilla is more than serviceable. Bryon Cranston is excellent until he is written out of the script during the first half of the movie. Ken Watanabe is also solid with the limited screen time he is given (his character is an homage to the original 1954 film). The main character, “Ford”, as portrayed by Aaron Taylor-Johnson, ties together Godzilla’s narrative arc. He is a two-dimensional soldier and family man. Adams portrays the character in a more than adequate manner. His wife, played by Elizabeth Olsen, is an obligatory part of cliched nuclear family in crisis because of the big bad monsters trope, and has very little to do in that role. During the filming of the classic 1954 Godzilla film, a very young and handsome leading man by the name of Akira Takarada arrived on the set. Takarada was looking for the director of the film. While wandering about he told some stagehands that he was the star of the movie, and needed help. They replied that “you are not the star of the movie, Godzilla is” as they turned and walked away. By the time Gareth Edwards’ Godzilla finally makes a proper entrance, the movie has been burdened by needless exposition and the inclusion of two other monsters that should have been edited out of the script. Godzilla should be the star of his eponymous movie. Gareth Edwards’ failure is rooted in how he forgot that basic fact. The last Godzilla movie I saw in the theater was in 1998, with my sons aged six and eight. I didn't enjoy the film, but we had fun being out together. Today I am going with my sons to see the new one in 3D BTX. I haven't seen them in many months, so I'll enjoy the experience, just being together again. The only problem I have is I keep seeing all these Godzilla trailers featuring Aaron Taylor-Johnson. I completely accepted him in his role as John Lennon when I saw Nowhere Boy, so now my brain is telling me John Lennon Vs. Godzilla. Nothing to challenge the stereotype that Americans can't make Godzilla movies. I hate movies that put me to sleep. The Host is a great movie. Monsters was so good. These summer blockbusters are made by committee. In the director's defense he did not write the film. Who knows what his vision actually was and how it is different from the final product. I haven't seen Nowhere Boy. Is it worth it? Do engage the movie with your family. That is the whole point and those memories will stay with your forever. I watched many bad movies with my mother and father. I forgot many of them but I remember being with my parents. I would see it for a 3 dollar matinee or for free if someone treated me. If there was an IMAX Groupon I would see it there too for the experience. Is this a good Godzilla movie? No. that's disappointing. I saw a trailer for it and was intrigued by the sheer size of Godzilla. It looked epic. I haven't seen a movie in a long time. I think the last one I saw was Prometheus about two years ago. that was pretty thrilling and dramatic. Another great sci-fi film I saw at home was Outlander. If you haven't seen it, the basic plot is a crash landing by an alien in 700's Norway. He has an alien monster aboard and he has to gather the trust of the community to help them fight it. Pretty good stuff. Nowhere Boy was a decent film, basically a young John Lennon battling to keep his head together in the midst of family tragedies. I agree, even a bad film can be an enjoyable night out. I remember when my kids were real little, and we saw "Wild Wild West" and oh! how I loathed that film, but I made my sons laugh with my comedic rants against it. So in the end we won, I guess, even though Jon Peters stole my hard-earned money. We came back from Godzilla matinee. Over the past few years, there has been some distance and tension between me and my youngest son, but today we've reconnected. Two years ago he would have politely turned down my offer to see a movie. But lately the ice has broken. So I'll always think of this Godzilla movie as the day we became family again, and look fondly on it. Some movies, if I'm excited enough about them, I'll go see by myself. This latest Godzilla, I wouldn't have enjoyed by myself. It was all about the experience. Movies bring people together. That is all that matters. I hope that you and your son see many more movies and continue to build the relationship. I have a few issues with your review which then beg to question your ability to review the film. Most importantly you got the main characters's name and actor wrong. The character is called Ford Brody and he is played by Aaron Taylor-Johnson. Gareth Edwards is a British director and Monsters was made on a budget of $500,000. In regards to the film, did we watch completely different versions? Godzilla has fantastically married a monster movie with a character driven drama that uses a well written script to feed you information rather than explain the entire plot in the first five minutes (Pacific Rim if you couldn't guess). Rather than just have Godzilla wreck havoc because he's a monster, this film has chosen to put the relatable humans in the forefront. Because the humans are relatable the audience are able to associate with them, making you care and feel for them. Godzilla has been dormant for 60 years and so it is no surprise that he is tired, imagine waking from a long sleep and the first thing you do is have a massive fight. Your remarks about the military baffles me as the military would never continuously fire upon these monsters as they know it does no damage. Edwards has stated that he is always in pursuit of realism (the more accurate term would actually be naturalism) and so that is why the military doesn't fire everything with their "over-confidence", they know it won't help. Finally, Godzilla has no interest in the humans. His only goal is to kill the MUTOs. To counter your final point, should Jaws not have more screen time in his movie? A reminder that discussions of popular culture are inherently felt and experienced by some as moral judgments. Always good to see that play out in the "real world" as opposed to in the critical work on cultural studies. I listened to an interesting piece on NPR last week about why and if blogs and other websites should allow comments because of trolling and the ugly and rude behavior of many commenters. One of the guests said his strategy is to actually talk to posters and trolls in a nice way as his theory is that most simply do not know how to manage their tone online or have not been taught how to take a step back and think about how their words may be received. I will try to apply that logic here. Sorry about my error about the names, I saw the movie late on Thursday and in the interest of providing something timely and that may be of use to the readers of WARN, I looked at IMDB and switched the names of the characters. I am sure this has happened to you before, when writing something under the pressure of time, you make an error. I stand by the substance of my claims however. The information on Monsters' budget came from a BBC or Times UK piece on the film. If you have some other information that contradicts their's please do share it. On the other matters we will simply have to disagree. That is the beauty of how different individuals and audiences process, interpret, and respond to popular culture. You found the characters relateable. I, and others, found them flat and uninteresting. How one soldier can somehow be all places at once, flying to Japan, getting back to the States, hopping on trains with nukes, then HALO jumping into San Francisco, and then finding his family after destroying the MUTO's eggs is not very compelling to this reviewer. I felt like there was quite a bit of exposition in the film. For something like Godzilla perhaps that is necessary; some of it could have cleaned up in a rewrite. Maybe your king of the monsters needs to take naps after using his atomic breath. Mine does not. Call it a matter of personal taste. I appreciate the correction on the name of the character. I apologise for coming off as a troll as that was never my intention, however up in your comment I see how I can come across as aggressive. I also realize that mistakes are made in the haste of deadlines. In regards to the film itself I have watched it twice. The first being in IMAX and the second on a regular 2D screen. A theory I have is that your interpretation of a film can often rely on who you watch it with. With the IMAX screening I was sat between two people who, like myself , loved the film and so I believe that has a huge effect on how I perceived the film. Many films have their shortcomings and Godzilla is by no means an exception (Brody would never have been able to preform a HALO jump without a lot of prior training), but when you are engrossed in a film you allow them to slide. 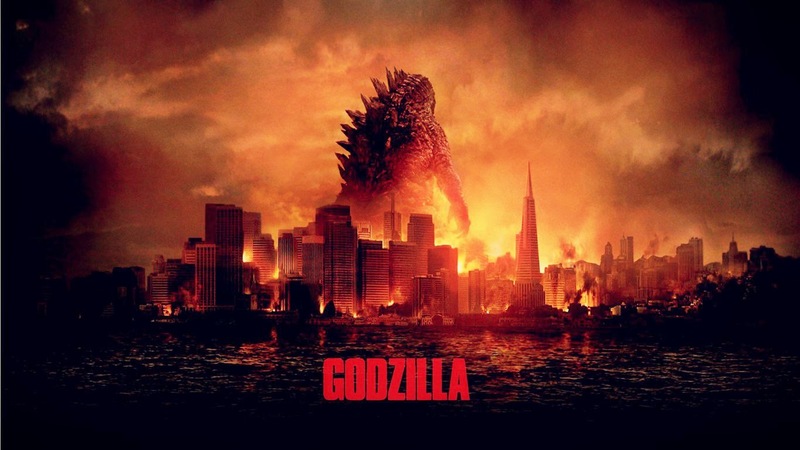 There is a hefty bit of exposition, but in such a film you need it to understand what is happening and I think that Godzilla has done it in a good way, slowly feeding you rather than the common line of dialogue that explains it all. Lastly I feel that a discussion about films are great because it makes the audience think about what they have watched rather than just soaking it in and not analyzing it. That is why my previous, somewhat aggressive, comment was an attempt to excite such a discussion. You are spot on in the sense of how audience matters. I am sure that in some small part of the universe on the evening that Star Wars: The Phantom Menace debuted that there were audience members who were enthralled and excited by it. Who knows? This Godzilla may not age well. Time will tell. Well written and and honest. Does it matter what his name is? The guy is a vacuous non entity, unfortunately you get to see him for two hours instead of Godzilla. Wow! I agree 100% with your review. I was so mad walking out of this movie I couldn't wait to go online and rip it to pieces. I really wanted to like this Godzilla film but Edwards dropped the ball big time. The trailers were awesome, better than a movie. Marginally better than the 1998 film? I respectfully disagree. This one was just as bad, but with less stuff happening and took itself way too seriously. It's a freaking giant, radioactive, fire-breathing dinosaur! Who could possibly be mind-bogglingly stupid enough to try and make it serious, especially given the lack of a socially relevant message about nuclear war? The 1998 film was bad, but at least I could enjoy it as a bad movie. This one was too dull even for that. A truly lost and missed opportunity. Glad I am not crazy in my disappointment. As I mentioned above, two Gojira fans got up and walked out about halfway through. Here is my idea for the sequels. Your thoughts?